Purevision 2 with High Definition Optics are designed to reduce glare and haloes around lights, whilst delivering crisp, clear vision, even in low light conditions. The advanced silicone hydrogel material offers comfort and breathability and provides good handling, which is aided by a light blue visability tint. These lenses are designed to last one month and are for extended (overnight) wear. Versatile monthly disposable lenses that are designed for daily or extended wear. Each box contains 6 contact lenses in a buffered saline solution for easy insertion. Packaging comes in two variations - with and without 'HD' logo. Both contain identical HD lenses. I was impressed with the description and promise that 'halos' were eliminated and vision would be crystal clear...well, if I could have tolerated these longer than two hours, I may have had an opinion on that particular claim. They come in very impressive packaging, huge (I thought maybe I had ordered wrongly, could these packages REALLY contain only ONE contact lens?) having battled with the individual packaging and retrieved the contact lens, I noted how thick and odd shaped the lens was. It was distorted and did not appear to spring into a perfect round shape like I was used to. I hoped that once exposed to air it might alter its shape (Sorry, not been wearing lenses for too long) but it seemed to become even more uneven in shape and I inserted it with more than a bit of concern! Actually, I was surprised that it felt comfortable and decided that perhaps my initial concerns were unfounded. Regretfully, I had to remove the lenses within the first two hours due to dryness and scratchiness. I cleaned them, re inserted them, but still the same feeling - dry, itchy, poor focus - certainly not as comfortable as other brands I have tried in the Silicone Hydrogel range. Waste of time and money - these have to be ordered in. I was part of the original clinical trials in the UK for continuous wear lenses and have been wearing Bausch & Lomb Purevision lenses ever since. 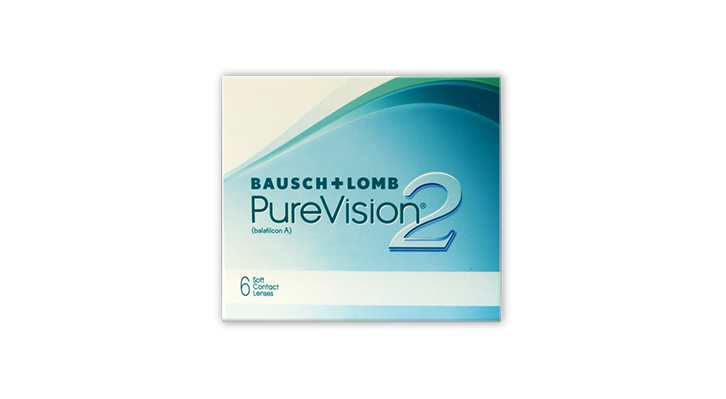 After many satisfied years the standard Purevision lenses are no longer available and the Purevision 2 HD were the recommended replacements. Naturally I was a little sceptical changing lenses after so many years and especially reading the reviews here about comfort. However I am happy to report that I've just completed the first month in my new lenses and really can't say I've had any issues. They are as comfortable as my old lenses with no dryness or itchiness even after what I consider the ultimate test of a longhaul flight. I can't say I noticed any significant improvement in quality of vision, halo's etc but I am happy with the quality anyway. I regularly have my eyes checked and my optician reports no problems with protein build up or the general health of my eyes due to continuous lens wear. Lenses and especially continuous wear lenses may not be for everyone so it comes down to each individual and their personal fit and taste. In my humble opinion though these are great lenses and well worth it if they work for you. in real is only waste of money. The longest period I was wearing a pair - it was two weeks but second week was really uncomfortable... itchy eyes, watering, far away from clear vision. I wanted just finish packet and never buy it again and as an extra I have an eye infection for the first time in my life!!! After using a different brand for several years I decided to give these Lenses a try. At first I disregarded the more negative reviews thinking that those were due to individual issues rather than the product itself. However having tried the Lenses myself I now agree with them. The Lenses are not very comfortable,too thick, dry quicker than any other continuous Lenses I've worn and most of all lead to persistent blurriness in bright or very cloudy days. I do not recommend them at all! These are very good contact lenses but not as good as the purevision which have been discontinued. They tend to fall out for no reason at all, good when theyre in but just don't like staying in my eyes!